I’m calling for a plan of action. Fantasy football was created in the image of the holy sport we all love so much. The status quo, however, devalues the unquestioned leaders of the NFL on the offensive side of the ball and instead crowns the dime a dozen running backs king. It’s about time somebody stands up for a position that simply doesn’t get the respect it should, in an era where it dominates the game. Quarterback strategies have become pretty black and white for the past decade or so. When there’s little depth, take them early. When the position is loaded, wait it out. While it affects your draft, it only affects one component for your starting lineup, unlike the wide receiver and running back positions. In most drafts, the planning around wideouts and halfbacks is more much intricate than it is with quarterbacks. The problem I have with what’s going on is simple; with quarterbacks putting up madden-like numbers on a consistent basis (Josh Freeman just had a 4,000 yard season) in thanks to freakish athletes, innovative schemes, and more aggressive playcalling, playing in leagues with one quarterback just doesn’t cut it. How is it that a defense gets drafted before a very good starting quarterback? Jonathan Stewart, an injury prone back in a timeshare that currently is running on two bum ankles is being drafted ahead of Jay Cutler and Ben Roethlisberger (although his ADP has dropped nearly 3 rounds in the last week). These guys are being drafted for depth, ahead of the players who will undoubtedly put up more points than them during the season. These quarterbacks are left to ride the virtual pine, hoping for the occasional matchup play, injury, or bye week along with your injured, failed, or stashed players when they should be getting your team points. Something has to be done. That’s why I actively participate in and support as many two quarterback leagues as possible. This is much easier to do in 8 or 10 team leagues (although I loathe 8 team leagues) than it is in 12 team leagues, where the lack of backups make having a rb/wr/te/qb a more feasible option. In 10 team leagues, you are forcing the league to be more resourceful. All conventional wisdom goes out the window once a second quarterback is added. Instead of deciding whether to go qb early or late, you must now take into account how you will draft your quarterbacks, and how your plan affects where and when you fill the rest of your roster. Maybe you’re pairing an upside guy like Cutler with Brees and are hoping a breakout year from Cutler gives you two stud qbs while you focused more on top running backs and mediocre wideouts. Maybe you want all dual threat guys so you get Cam Newton and RG3 as the meat of your team. Or perhaps you just got so caught up with the lack of running backs and plethora of wideouts that you wound up with Eli Manning and Josh Freeman, with CJ Spiller, MJD, and Chris Johnson as your first three picks. Regardless of what strategy you incorporate, one thing remains the same; the guys who get the points are in your lineup, and like any other position, depth is just as important. Handcuffing a volatile qb situation can prove to be as beneficial (remember the back and forth between Vick and Kolb in 2010?) as handcuffing Arian Foster with Ben Tate. On the flip side, don’t you find it a challenge to have to think about who you want to start at quarterback for once, especially if one of your starters go down and a few waiver wire heroes can make or break your season? As football is pushing boundaries with the level of quarterback play, so too should your fantasy league. We need to get these contributors in your starting lineups ASAP instead of letting them waste away on your bench along the likes of Sidney Rice, Jonathan Stewart, and Joique Bell. If three different running backs from the same team can all contribute to your fantasy team on a consistent basis in deeper leagues, why cant a starting quarterback who throws for 4000 yards and 25 TDs? It’s about time the 2 QB system takes over, and I’m calling for it now. So what’s it gunna be then, eh? If you’ve ever seen or read A Clockwork Orange, you’ll know exactly what I’m talking about. In fantasy football, it’s question you ask yourself over and over as the clock is winding down and you need to pick. You’ve read every ESPN, Yahoo!, and Rotoworld article imaginable, scoured through every cheatsheet, and have even made your own rankings. No matter how prepared you are (or think you are), be prepared for chaos. You may think you know what you’re going to do until you’re on the clock. I’ve done it. I remember blurting out “Torry Holt!” as time expired one year. This of course was when he signed with Jacksonville, clearly was on the decline, and in that stupid moment of word vomit, I ruined my chance at back to back championships. Don’t be that guy. If I’ve learned anything from playing fantasy football the past decade, it’s hold back the word vomit. Fantasy football isn’t a time to let chaos ensue. Your guy gets taken? So what, there’s a hundred other guys that can make up your team. Be angry, upset, afraid, whatever, for a few seconds, then take a deep breath, and get back to the board. Be cold and calculated, not reactive and emotional. These, along with the rest of this piece, will be tips to help you not only survive, but dominate your draft. Tagged Aaron Rodgers, Adrian Peterson, Calvin Johnson, Darren McFadden, ESPN, fantasy, fantasy football, fantasy sports, football, jamaal charles, Michael Vick, Nate Burleson, nfl. fantasy draft, Percy Harvin, Quarterback, Ryan Broyles, Tavon Austin, Tony Romo, yahoo! Yesterday, I wrote a piece on some of the best players over 30 that would make up a great offense. In this part, I’ll go over the best offensive lineman over 30. There’s a common saying in football that the NFL stands for “not for long”. In fact, the average NFL playing career lasts about three seasons. Sticking around beyond that, let alone maintaining a high level of play is nothing short of impressive. Over the last few seasons, we have seen an influx of young superstars who are shaping the game and will look to do so for the next decade. But what about those who have been doing it already? More importantly, those who are not only old, but are still valuable contributors. Most people consider old vets simply as mentors, but there are many that still hold a valuable place on the field. I decided to make a list of players in their 30s who aren’t letting up anytime soon, or are still playing at a high level. Today, however, I’m focusing just on offense. About a month ago, I listed my ultimate offense, where I made a list of what players I would want on my dream offense and what type of scheme it would be. Here is part two of that post, where I will talk about my dream defense. On defense, I prefer an attacking 4-3, similar to what the Giants run, sprinkled in with some 3-4 looks. For that, I need versatility along the defensive line. I also like corners who are aggressive, are strong in man coverage, and physical at the line of scrimmage. My free safety needs to be a ballhawk, and my strong safety needs to be averse in both pass coverage and lining up in the box to stop the run. With that, here is my ultimate defense. Ever wonder if your favorite athletes were superheroes what their persona would be? 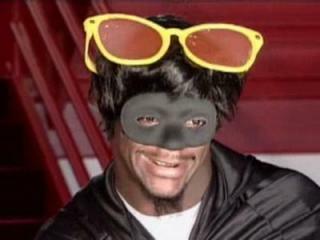 While Clinton Portis may have been the only player in the NFL who actually dressed up, I like to think there were other superheroes who played football. I fantasize about things like Calvin Johnson pulling a Mr. Fantastic to catch a ball, or Vince Wilfork absorbing lineman and ball carriers like The Blob quite often. I figured I’d share some of them with you all. A few days ago, I recently highlighted five teams that I think can turn heads this season. I mentioned I’d be going over five teams that I think can disappoint given expectations. I’m not saying these teams will go 0-16, but I think there is a good chance they underperform.